OP: Pretty average song and animation. The song ended way too abruptly. The mood jumps several times between calmness and action – way too many times for my liking, and with no good transition. 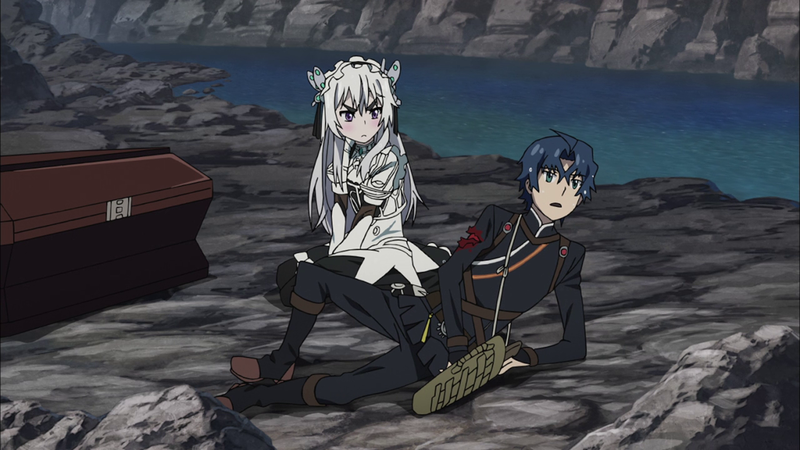 Chaika was good here, though. ED: The ending song was much better in my opinion, staying consistently dramatic throughout the one and half minutes. The sinking part at the beginning looked amazing too. Voice acting: Chaika’s voice and manner of speaking is adorable. Tooru sounds manly and dependable enough. His sister Akari has a very fitting voice too – the voice of a strong independent woman. A nice combination, that does not sound annoying or anything. Visuals: There isn’t really much detail in the graphics of Hitsugi no Chaika, but there were a few things that I liked. 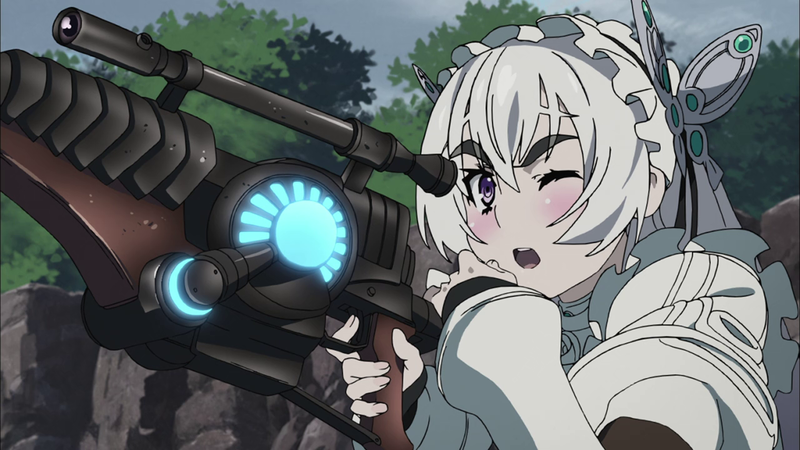 For example the character design of Chaika (yes, as you might have noticed by now, I found her character the best in this anime). She has white/silver her, but has thick black eyebrows. Unique. And the lovely gothic outfit… The Iron-Blood mode of the siblings looks strange with the red lines on the face. Oh, and hooray for no blood/gore censorship! Characters: There are three main characters. Firstly Tooru Acura. He is 20 years old. He used to be a soldier, but is now retired – all he does is sit around the house now, contributing nothing and only being lazy. Nevertheless, he’s actually a helpful young man, who understands how miserable he has become, and is even ready to accept death. His weapon of choice is a knife with a curved tip. Just like his sister Akari Acura, he can use a special technique called Iron-Blood Transformation which gives him face paintings and turns his hair red. Also gives his whole body a red glow. Akari on the other hand is working hard to provide for herself and her useless brother. As a fighter, she uses a battle-hammer. On the surface, she is cold and emotionless, but she actually respects her brother to the point of calling him “ani-sama” and telling him to not insult the image of a brother she respects a lot. Finally, the one I’ve mentioned a lot in this review already – Chaika Trabant. She is a strange girl, who was given a mission to change the world, by a sea monster. He (or should I say “it”) calls her the daughter of emperor Arthur Gaz. She has a strange way of speaking, saying only partial phrases. She gets excited easily, and is trying her best at everything. She also strongly believes in her mission, and does everything to accomplish it. At first I thought she was a loli, but she is 14 and is too tall for one. Story: Chaika Trabant met a sea monster who gave her power to change the world, and that becomes exactly her mission from now on. Some time later, she gets lost in the mountains, and is only saved by Tooru, who she meets by accident. Together, they beat a unicorn (who are evil very creepy creatures in this anime), sent by one of Chaika’s pursuer’s. 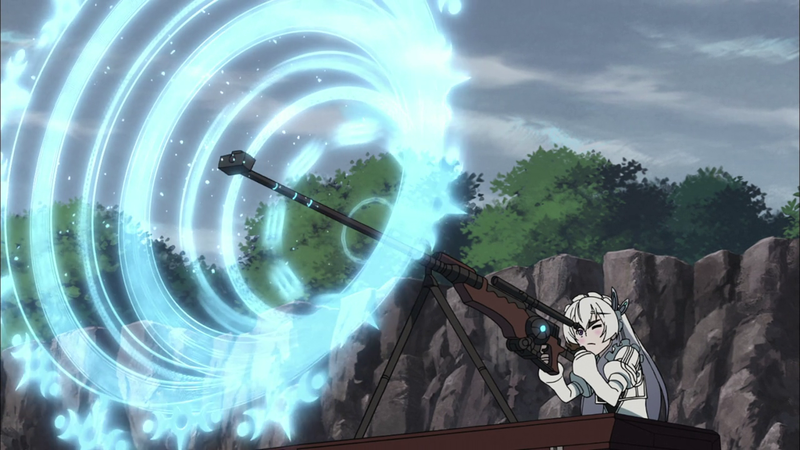 While Tooru buys time with his transformation, Chaika prepares a magical gun that needs time to activate. When everything is ready, she shoots the unicorn and it is cut in half. Tooru is then treated to a meal by the girl he just helped, and immediately attacked by his sister, who is mad he is having fun with a girl instead of gathering edible plants like he should. 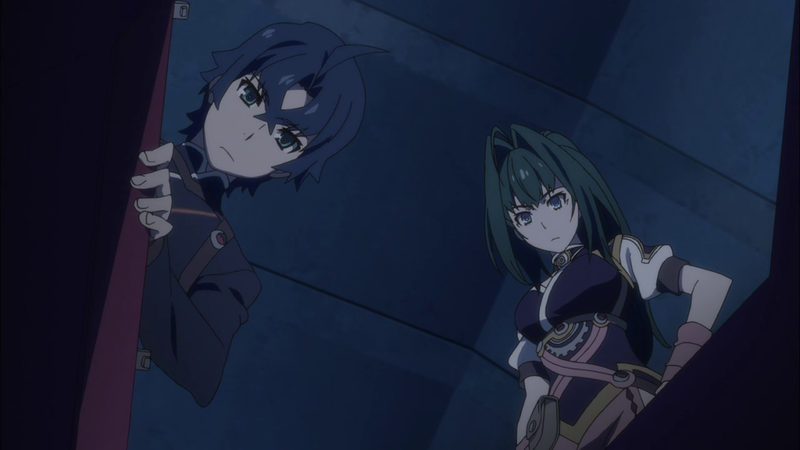 The two agree to help Chaika in recovering something from a lord living in the town – which turns out to be one of 8 magical items acquired in a battle to take down emperor Arthur Gaz. As they infiltrate the mansion, the lord mistakes them to be part of Kliemann Organization, which asked him to return the item earlier that day. Of course he has no intention of doing so – instead he makes swords fly towards Tooru, almost killing him several times. When he notices Chaika, though, he panics and says she should have been dead. Although this was just the first episode, I have a feeling this will develop similarly to an anime called Sands of Destruction (relatively unknown anime), where the characters team up to travel to end the world with a magical item. Same here, except the magical gun is supposed to “set the fate into motion”. That anime wasn’t very successful, though, so I’m not sure how this will turn out. Conclusion: I liked the characters, but that’s pretty much it. Nothing else stuck out too much, so it was an average anime, deserving an average score. Sure, there is potential for story development, but it seems like it will turn out quite boring and similar to other series in the past. It was also the last of the animes I was looking forward to watching this season – everything else is new grounds for me, and I can’t guarantee that I will watch many more. Posted on April 17, 2014, in Anime, First impressions, TV and tagged anime, chaika, coffin princess, first impression, hitsugi no chaika, magic, spring 2014, travel, TV. Bookmark the permalink. Leave a comment.